Between 1951 and 1955, the young poet Phyllis Webb was preoccupied with the lot of the poet and the state of Canadian publishing. In 1951, at the suggestion of Earle Birney, then professor of English at the University of British Columbia, Webb designed a questionnaire to gather information and mailed it to “almost every poet of any merit in this country” (“P&P” 1955, 499). During a difficult and transitional period for Canadian poets and publishers of poetry, Webb’s questionnaire served as a focus for concern and catalyst for solutions. 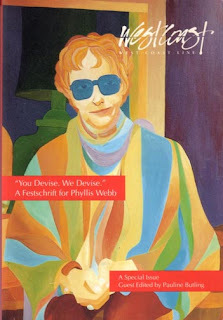 Its significance was most directly felt by Phyllis Webb herself; the questionnaire brought her into contact with other poets and with publishers, made her cognizant of the Canadian literary climate and pointed her in a number of directions which she would pursue in the following years. I’ve gone through this essay, and this issue, again recently, while co-crafting the new selection of “12 or 20 questions” for small and micro-press publishers and editors. Most literary writers and writing aren’t written of nearly enough, if at all, in this current climate, and publishing ventures, even less so. For a period in the mid-1980s, Grain magazine out of Saskatoon was producing pieces on the history of literary presses, short histories of presses such as Thistledown and Turnstone. Shouldn’t all presses have such opportunities to tell their stories? How the hell did Hagios Press get started, for example, or BookThug, or even CUE Books? How can even the writers published by such presses know so very little? To know that Vancouver’s New Star Books came out of The Georgia Straight Writing Supplement which came out of The Georgia Straight which came out of the fourth editorial period of the poetry newsletter TISH, giving the press a history that goes back to 1961. Or what of Fredericton’s Goose Lane Editions, which came out of Fiddlehead Poetry Books, thusly out of The Fiddlehead, or bill bissett’s blewointment press that was sold to become Nightwood Editions (over the past few years, editor/publisher Silas White has established a blewointment imprint to, in part, acknowledge this lineage). Most small press books and chapbooks don’t even seem to get reviewed, so any larger or longer conversation of press activities can’t help but get overlooked. Why are so few of these stories ever asked for, ever told?